There Is A Cat Hidden In This Picture But You Won't Find It! We've been scratching our heads trying to find the furry pet whose managed to camouflage itself in the woods. Yet another optical illusion has sent the internet into meltdown, as readers pull their hair out trying to figure out just where this little kitty has hidden itself in this photo. The image, submitted to Reddit by user Jmankruse, has been viewed over 5,000 times and shows a pile of logs in the middle of a woodland. 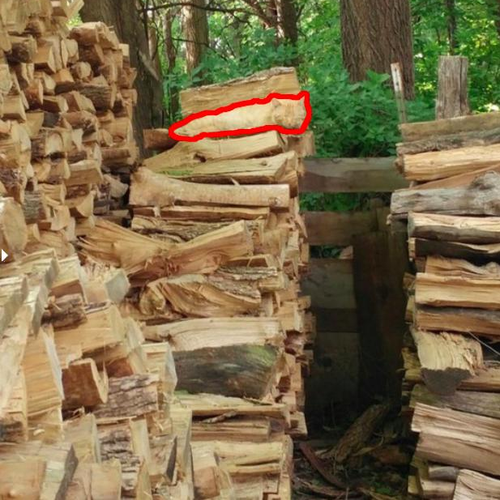 From a far the picture looks completely normal, until you look a little closer and realise there is actually a tabby cat hiding among the pile of logs. Read more: This Cheeky Optical Illusion Shows How Naughty Your Mind REALLY Is! We'll help you. If you look down towards the pile of logs in the centre, you'll see that the second log down isn't actually wood but a cheeky tabby cat having a little snooze!